Right now you are likely extremely frustrated with your sliding door. For many, this frustration has likely been going on in their Sydney home for many years. If you are like most of our clients then you just want your sliding door to slide properly. Doesn’t seem like a big ask, does it? 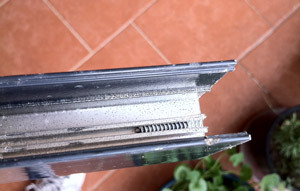 The good news is, the team at Adsafe Doors has seen all the common sliding door repairs. We have been operating in Sydney since 1992. In particular, sliding door repairs have become one of our primary services, and domestic sliding door repairs are at the top of the list. We carry out dozens of sliding door repairs per week, and most are aluminium. 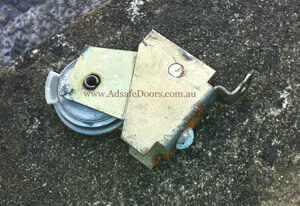 Always a door roller or door wheel replacement. 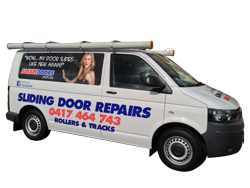 Here are some of our satisfied sliding door repair clients in Sydney. Just click play on the video below to view the video. Usually, the need for a sliding door repair in Sydney is initiated by the failure of the tire on the door roller. Since the tire is made from a synthetic material and bears a lot of the weight of the door, it needs to be high quality. Unfortunately, most door rollers in older doors are of a cheap quality. As the sliding door roller cushions the door roller from the door track, it is a key part of a smooth sliding door. As the tire on the door roller disintegrates, the sliding door track comes in contact with the exposed ball bearing of the door roller resulting in metal to metal contact. At this time, the sliding door track can deteriorate quickly, and this, in turn, accelerates the failure of the door roller leading to the complete failure of the door. Our Sydney clients usually find they cannot move the unit and they call us to do a sliding door repair. Since aluminium sliding door repairs are most common, let us assume that the above scenario is for an aluminium sliding door repair. So with a glass and aluminium sliding door repair, we must be careful of two things. First, when we remove the bottom of the door to get access to the carriage of the door roller, we must take care of the glass. Glass sliding doors are extremely heavy. You must have the right equipment to be able to remove the door safely. Too often we see people trying to do it themselves and a small slip and you have glass shattering all over the room. A glass sliding door which shatters into thousands of pieces is dangerous for all involved. Not only that but it is very time-consuming to clean up. Secondly, we try to prevent the heads of the screws that hold the door together from breaking off when they are unscrewed. If the screws break (just like what happened in the picture to the left), which is very common, we will have to remove the remaining body of the screw so that a new fastener can be fitted. Making sure your locks line up is most important since the new fasteners hold the door together. Then we put the door back on the sliding door track and adjust the door rollers such that the door is square in the frame and we can then adjust the lock. The problems with the lock are often caused by the door rollers collapsing. This causes the door to drop thus preventing the lock from lining up correctly with the frame such that the door can’t be locked. Note that after we complete a sliding door repair and replace the sliding door rollers and carriages and put the door back on the door track the door can be adjusted to the correct height to facilitate locking. Once we have completed your sliding door repair, your door will line up perfectly with the lock and you will be able to easily lock your door. Steel door rollers or synthetic ones. Which is best? The replacement of the door rollers with synthetic tires with steel rollers is not necessarily the preferred option since most average sized sliding door frames are relatively light. Light doors can bounce when they are slammed or opened quickly. If the door bounces and the door roller is made of a synthetic material, the track will be protected. However, if the door roller is made of steel, the door track will not be cushioned and the roller will make a dent in the door track. But if the door is heavy it will be less able to bounce on the door track, and the sliding door track will not be damaged. Which roller is best for heavy sliding door repairs? In other words, heavy doors can have steel door rollers, and light or medium doors are best suited to have door rollers with synthetic tires. A point to note is that some sliding door repairs can be carried out without removing the fixed glass panel because the lip on the threshold is sufficiently low for the door roller and the door to fit over. However, often some door rollers synthetic tires protrude well below the bottom of the door. When this happens, and the door is refitted such that the new door roller is forced and dragged over the lip of the threshold the tire gets damaged and the carriage gets bent. This sliding door repair very quickly results in another repair. No doubt you have some questions about your sliding door brand, the type of service you need to be completed and the cost. So give us a call via the details below.